You are here: Home / Uncategorized / Steak dinner in the middle of the week! Steak dinner in the middle of the week! I got this idea from one of my favorite websites http://crockpot365.blogspot.com/ there are some awesome recipes over there. Check it out. This is going to be so super easy! Love it! Steak, potatoes and corn on the cob are going in the crockpot tomorrow. This one is so simple. Place the steak in a zipper bag with onion, steak seasoning and apple juice. 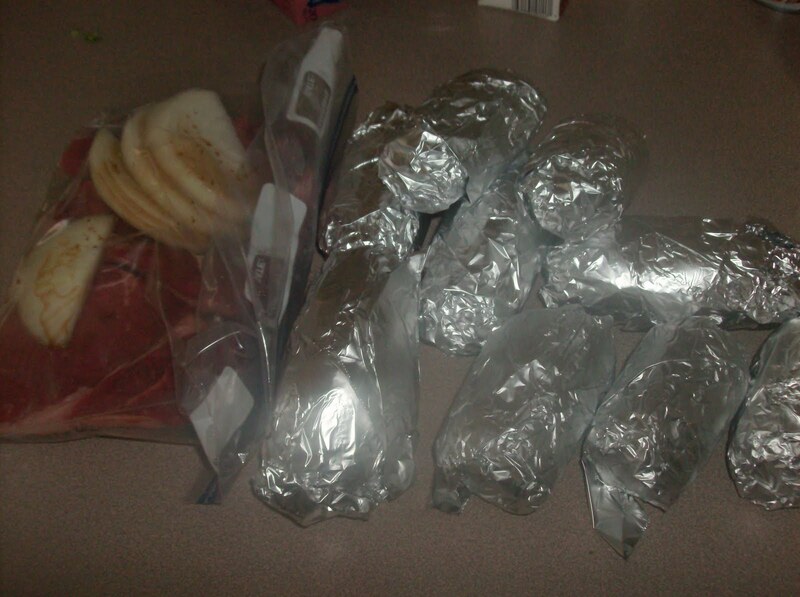 Wrap potatoes and frozen corn cobs in foil. Keep in refrigerator until ready to cook. Empty steak bag into crockpot, cover with layer of foil, put potatoes and corn on top and cook on low 6-8 hours!! I am serving mine with an iceberg salad wedges with ranch, blue cheese crumbles, bacon bits and tomatoes. I already pre-chopped everything so only assembly will be required.